"Really poor children, in really poor neighborhoods have no habits of working and have nobody around them who works so they have no habit of showing up on Monday. They have no habit of staying all day, they have no habit of I do this and you give me cash unless it is illegal." While this blog post won’t have my usual data-driven spin, I wanted to provide my own education-related reaction to Gingrich’s over-generalized comments. Do some poor kids engage in illegal activities to make money? Absolutely. Do some affluent kids also engage in illegal activities to make money? Absolutely. Vocabulary deficits- a plethora of research exists that quantifies the vocabulary deficits of poor children. As a parent of a toddler, I am particularly interested in language acquisition before age three. Affluent children are exposed to 30 million words by age three, as compared to 10 million words for poor children. It takes some pretty deliberate attention by early childhood educators to help close this gap before it persists and widens. By age six, low-income children know, on average, 3,000 words, while affluent children know about 20,000. Postsecondary expectations- Family history of college attainment affects the household expectations for, and conversations about, attending college. Summer Slide- Children from financially stable environments have the benefit of parents who can afford to enroll them in camps, sports teams, music lessons, or take them on vacation, whereby providing them with educational experiences that advance learning throughout the summer. An analysis of the research of Donald Hayes and Judith Grether with high- and low-poverty students in 600 New York City schools showed that rich and poor students had seven-month difference in scores at the beginning of second grade but this widened to a difference of two years and seven months by the end of grade six. Maslow- I personally experienced the emotional stress and strain as a child worrying about parents’ job security, food, safety and security in a low income home. 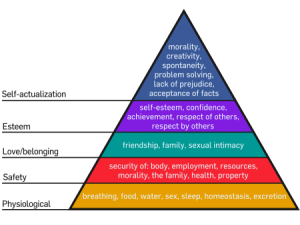 It goes back to basic developmental psychology and Maslow’s hierarchy of needs. I used to administer after school detention. Not the most beloved role in a high school, I know. But believe it or not, there were students who would act out in order to purposefully be assigned detention. Others would show up and sneak into detention without being on the roster. Why? They did not want to go home. When I taught Maslow’s hierarchy of needs to my students, I explained it in this exact educational context: If there is a student who is homeless; or hungry; or getting too little sleep because they are cold at night when their heat gets shut off; or stressed out about their safety at home because they have an abusive parent or violent neighborhood, how can I possibly expect them to do their homework or study for my exams?? In good conscience there is no way I would expect my classwork to be a priority if their more basic needs are not being met. I understood this, and expressed that these students need to reach out to educators and counselors for assistance. Because, unfortunately, we don’t know who needs help until students trust us enough to self-advocate. While socioeconomic factors do affect achievement, they do not affect a student’s ability to make progress within the school year. We see this at SAS in the work we do with EVAAS in 20 states. While it is no easy task, effective teachers have proven the ability to make up achievement deficits time and time again. So how dare we affluent adults alienate poor kids by calling them lazy or criminal when we should be their catalysts for change, helping to narrow the opportunity and achievement gaps that start at home, and ensuring they end once in school. Hi, I’m Nadja Young. I’m a wife and mother of two who loves to dance, cook, and travel. 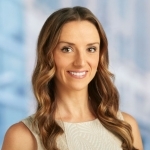 As SAS’ Senior Manager for Education Industry Consulting, I strive to help education agencies turn data into actionable information to better serve children and families. I aim to bridge the gaps between analysts, practitioners, and policy makers to put data to better use to improve student outcomes. Prior to joining SAS, I spent seven years as a high school Career and Technical Education teacher certified by the National Board of Professional Teaching Standards. I taught in Colorado’s Douglas County School District, in North Carolina’s Wake County Public School System, and contracted with the NC Department of Public Instruction to write curriculum and assessments. I’m thrilled to be able to combine my Bachelor of Science degree in Marketing Management and Master of Arts degree in Secondary Education to improve schools across the country. Terrific post, Nadja. Your thoughts clearly identify you and SAS as catalysts for change. There are so many educational resources available to help close that gap for disadvantaged students, but their effectiveness begins with a trusted relationship and someone who cares deeply. That could be a teacher, administrator, school volunteer or even a fellow student. We all have a responsibility to listen, be respectful of the challenges these kids face, and help meet them where they are before we can help get them where they want to be. Great point, Becky. We can't fault kids for being at a certain place when they enter our classrooms (either educationally, emotionally, financially, etc.) If we don't meet them where they are, it's extremely hard to get them moving forward. Thanks for your comment!